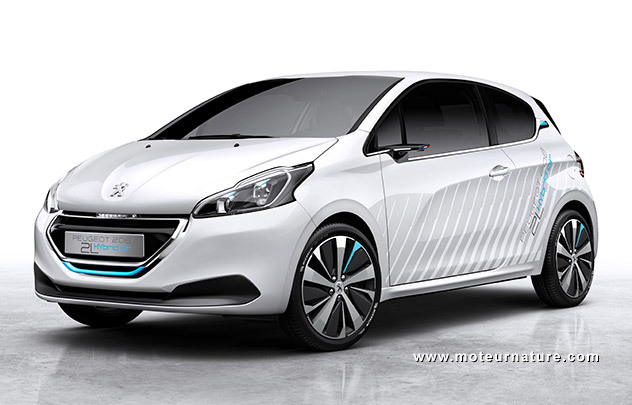 It was some eighteen months ago, that PSA Peugeot-Citroën unveiled its first hybrid-air concept, a Citroën C3. A Peugeot 2008 soon followed, and here’s a new concept for the upcoming Paris motor show. Based on the 208, the best-selling Peugeot, it’s much more than a hybrid air concept. Few details are revealed yet, but this concept is some 15% lighter than a stock 208, despite the added weight from the hybrid system. We’ll learn everything at the show, and besides the car, we expect to find out what Peugeot will do with its hybrid air technology. Our French edition published last year what was probably the harshest critics regarding hybrid-air, and so far the whole project seems to be stalled. We know that PSA Peugeot-Citroën was looking for a partner to share development and industrialization costs, but there’s no word that it found one. So maybe we’ll get news about this, or that the French company will go alone. All the other car manufacturers have chosen to develop hybrid electric cars, which offer the possibility of plugging in to allow zero emission driving of substantial distance. That isn’t possible with compressed air.